Editor’s note: The following is a lightly edited transcription of an interview Libertas Institute conducted with a student from Fremont High School who experienced a pat-down search after a student brought a gun to school on December 1, 2014. In response to the gun, police were called, the suspect student was taken into custody, and subsequently every single student was patted down as officials evacuated the school. Out of respect for the student’s privacy, we are not disclosing her identity nor that of her parent. Libertas Institute: Tell us about your experience at your high school during the recent lockdown incident. Student: During my third period class the principal came over the intercom and announced that all teachers were to lock the doors and no one was permitted in the hall. I just thought maybe it was a random locker search with drug dogs because they have done that occasionally. Then we looked out the window of our classroom and saw dozens of police cars and realized that this was not a drill. We continued to wait in class for what seemed like three hours after the end of our teacher’s lecture that day. Students were taking pictures out the window and calling family and friends. The principal then came over the intercom and announced that the school was being evacuated and that they would evacuate our classrooms one-by-one. We waited for another 45 minutes until a police officer opened our door and told us to all line up and leave everything, including backpacks, behind. They let us keep our wallets, cell phones, and car keys. They instructed us to go down the hall and split up into girls on one side of the hall and boys on the other. They had us put our arms above our heads and spread our legs. I placed my keys and cell phone on the ground. A female officer came by and patted me down. She thoroughly searched me over my clothing including under and around my breasts, my buttocks, and between my legs. When we were done with the pat-downs we were led outside to the football field. There were female officers to search female students and male officers for male students. I think they brought in additional female officers from nearby places like Ogden too. LI: Who was in charge of the searches? Were school officials in charge or present? S: No, it was just all police officers that I saw. LI: As a parent, when did you first learn about what was going on at the school? Parent: I first saw a fellow parent post something on Facebook and Twitter and saw reports from the Standard-Examiner about the police response to a potential shooter. I found out they were on lockdown from the news stories online. S: We didn’t know anything while in our classrooms until students began checking Twitter and listening to police scanner radio transmissions through smartphone apps. That was the only reason we knew there was a possible shooter. LI: At what time did you realize you would be searched? Did school officials give any notice over the intercom? S: No, we weren’t told anything. Because we were one of the later classrooms to be evacuated, we actually found out by calling a fellow classmate in another class that was already outside. They told us they were conducting pat-down searches. Otherwise, during the evacuation we didn’t really know anything. LI: Who opened the classroom door to let you out? S: A deputy sheriff, I believe, poked his head inside and told us to line up in the hall. Once we got out into the hallway there were what appeared to be SWAT officers and officers from other cities. There were two officers behind us and two more officers stopping us in the hall with additional officers assisting in the hall to split us up for searches. LI: Were there any teachers or administrators in the vicinity during the searches? S: Not that I noticed. I don’t remember seeing school staff until I was outside. In the hall there were just students. I didn’t see any teachers. LI: When did the officers notify you that you would be searched? Did they explain the reasons for the search? S: When they first opened the door they just said we were going to be searched and then evacuated. They didn’t give any reasons. LI: Did anyone object or attempt to refuse the search? S: No, we all just went along with it. We really didn’t know what to think. We had been in the dark for so long in our classroom and just went along with it when they took us out of our classroom. LI: Did officers ask for your consent to search you? S: No, they were pretty intimidating and just ordered us saying we have to do this and that, etc. They just told us we were all getting searched. They all had big guns and the feeling was very serious. LI: Was everyone to your knowledge searched? Did you know or hear of anyone who objected or was not searched? S: No, to my knowledge everyone was searched. LI: Did you think you had the right to object or refuse to a search? S: No, at the time I just sort of went with it. It was very intimidating at the time and I would have felt very awkward not complying. Afterward I started thinking more about why everyone had to be searched. LI: Did you hear about anything being found during the searches? S: I haven’t heard about anything specific. I wouldn’t be surprised if someone might have had drugs in a backpack or locker that the dogs might have found; but, I haven’t heard about anything and am not sure that that happened. LI: Did any students observe their bags being searched? S: No, the bags were searched after we all left school. We weren’t allowed to come back and get our bags until before school the next morning. P: An email was actually sent to all the parents stating that no one was allowed back into the school and no one could retrieve any property from the school until the next day. LI: Did they search lockers? LI: Was your bag searched? Did you notice whether it had been moved or touched? S: Yes, I am pretty sure it was. When I left class my bag was open with a book on the desk but when I returned the book was closed inside the backpack. So I am pretty sure it was touched or searched. LI: Was there any discussion among students afterward about the incident? S: Mostly people just curious about the individual who brought the gun to school. LI: How did you personally feel about the incident? S: It was a very weird experience. The cops were super mean, strict, and intimidating. I felt like we were being treated like criminals as if we were already guilty of something when we had just been sitting in class for three hours. And then I just wondered what was going on and couldn’t wait to go home. LI: Do you feel safer after this incident? Do you feel the searches were helpful and necessary? S: Not really. We’ve had drills before for shooter scenarios where we are supposed to lock the door, turn off the lights, and then hide and yet during this incident we didn’t do that. From what I understand, they already caught the kid with the gun so I don’t know why they needed to spend over three hours searching everyone in the school. LI: Were you ever told by a police officer or school official later that day or the next day why exactly you were searched? LI: Did you hear any discussion in the school about suspicions of another shooter at the school that day? S: I heard rumors from other students that apparently the school was unsure about whether the kid with the gun had any friends at school that also had guns but I didn’t hear anything official from school officials. Nothing official has been shared with me or any other students. LI: How do you feel about your personal privacy at school after this event? S: I don’t feel like I really have any privacy. I feel like when we are at school we have to comply with whatever they tell us. So if they say they are searching us or our backpacks then they can do that. LI: Have you had searches like this before? S: We have had drills. About a month ago we had some officers come through for a drill but we or our backpacks were not personally searched. LI: What were your feelings about this incident afterward? S: I am mostly just uncomfortable with the pat-downs and the way they were conducted. I didn’t appreciate being patted down in my private areas and felt like it was unnecessary. I also was not happy with the way they treated us. I don’t mind having to be stuck in our classrooms for three hours; but, the way they treated us when they let us out—barking orders at us as if we were criminals, and then patting us down—I feel was excessive. LI: Have you ever been patted down before? Was this time similar? S: I have been patted down at the airport before, but this felt more invasive and aggressive. I was more uncomfortable during this pat-down as they were grabbing my private areas when I hadn’t done anything wrong. LI: How did other students feel about it? S: A few of my other friends felt violated by the pat-down. LI: Did you know the shooter? S: I didn’t know him personally. I have had a class or two in the past with him but didn’t know him real well. He doesn’t strike me as the type of person to do this so I was somewhat surprised when I found out it was him. LI: As a parent what thoughts did you have after this incident? P: I first learned about the incident online and then from my daughter via telephone during the lockdown. Later, the school sent emails saying that the school was on lockdown due to a safety and security concern but they never did say exactly why or what was going on. Once I realized that my child was safe and that the school was secure I wondered why they were searching every kid. If another student had a weapon, they would have been locked into a classroom with a bunch of other students for three hours. I didn’t quite understand what justification or reasonable suspicion they had for searching all the kids like that. I wish a few students would have asserted their right to refuse such an invasive search. On the one hand, I am glad everyone was safe. On the other hand, once we realize everyone is safe and that the student with the gun was already in custody then we have the luxury of reviewing the event and the necessity of such searches. I just don’t understand what probable cause they had to search all 1,600 students in the high school. I think a pat-down of every student was a bit too invasive. LI: Did school officials ask for consent or permission from parents to search the students? P: No, the school sent out three different email messages explaining that the school was on lockdown for a safety and security concern and that it was taking longer than expected and that students would be staying on campus later than usual and then that the lockdown had been lifted and that no one would be permitted to retrieve their belongings until the next day. That was the only communication we received about it from the school. LI: What would you like our readers to know? P: When my daughter got home, the first thing she talked to us about was how invasive the pat-down was. It clearly affected her significantly. Second, my daughter was very intimidated by the way in which the officers acted and treated the students. They were all made to feel like they were criminals the way they were treated. As a parent, I feel like it was probably unnecessary for them to pat my daughter down in that way at school. From talking to others, it seems my view is in the minority and most people just defer to the authorities for the sake of “security,” but I feel the extensive pat-down searches of every student was not necessary and was a significant violation of the rights of our children. LibertasUtah exactly how I feel every time I travel via airports. LibertasUtah cboyack checking for beard cards? They are making a mountain out of a molehill.. It was stated they were unsure if there were any more accomplices. If procedure is to check every one before sending them out of the school for everyone’s safety, then that is what needed to be done. This is so pathetic and makes me furious to hear that people are complaining about a pat down when they should be thanking God they are alive and that no one was hurt. What a gross violation of the rights of those students. Yet there are some who would feel it is warranted and would subject people to searches at any time for any or no reason. A little something called the Bill of Rights is in place to prevent that, but some feel it is better to give up our Freedom for false sense of phoney security. It is pathetic that we have grown so complacent about the police state that is being shoved down our throats, one step at a time. I will not fly again, after being subjected to similar treatment the last time. Comrade ARE YOUR PAPERS IN ORDER??!?!!?? Step over here while we search you anyway. Here, blow into this tube. Are you locked into place with your seatbelt? I will now search your car because I can. BANG BANG….what right do you think you have to keep your dog in your yard when I want to search it? The cops have been plucking chickens and frisking sheep so far. Some day they are going to pick on the wrong people. I feel bad for these parents who feel they are in the minority for their opinions. Unfortunately, this goes on in our airports and transportation hubs, our borders, football stadiums, people just line up like herd animals and bleat but allow it to happen. This gross invasion of bodily privacy is absolutely not necessary – no more necessary than NSA doing blanket warrantless collections of our electronic data. Nor is it particularly effective in stopping terrorism. “If you see something, say something” is completely out of control and has actually gotten people killed. You’d probably be the first to sue for a lifetime’s worth of riches if your special snowflake was killed by another weapon discharged during the evacuation. We have to bring some order in a chaotic world. If people could just behave properly, the escalation of the police powers wouldn’t be necessary to combat lunacy. I’m frankly surprised that students complied with the authorities. The FTP generation deserves their treatment, they should respect authority, make a life that matters, breathe easy and live free another day. My children know if I’m contacted by police or if their names are mentioned on a police scanner, they better be the victims. If they aren’t, they will be when they get home. Well, one more step in the right direction. Things have to get quite a bit worse before they get any better. Amerikans just don’t care enough; we’ll have to lose what we have to know what to win back. njsjbjlj It makes me furious that our most basic rights are trampled on, ignored, refused, and the folks like you are encouraging and promoting this grotesquely un-American state intrusion. ThomasPayne Oh, I see, the existence of evil justifies perpetration of slavery and further violation of our natural rights. Principles matter, and expediency is never the way to exercise proper principle. Compromise on your principles and soon you won’t have any. some quote about sacrificing freedom for security neither free or secure ,yea that. I was born, raised and educated in a communist country. A nominally TOTALITARIAN country. 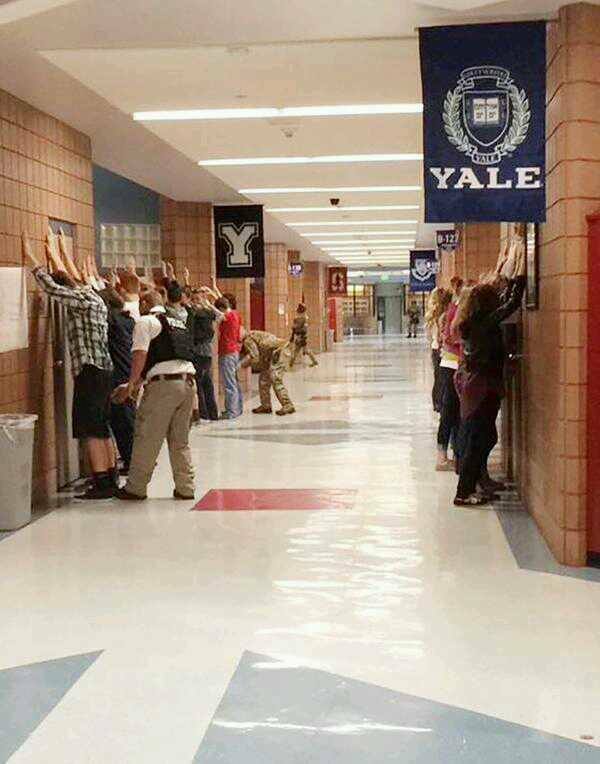 And nobody there, ever, ordered me or my classmates to “put our arms above our heads and spread our legs”. Parents who, under the guise of “safety”, support actions that strip their children of dignity and turn them into docile subjects are not only naive, but also guilty of all perversions their children will later commit, in service of the system their parents taught them to accept. Nazi and Soviet functionaries weren’t born as such. They were gradually conditioned to commit unspeakable crimes, for some “greater good”. The problem is most children are learning no principles at home. One interesting aspect — the school was NOT a “gun free zone.” Under Utah law, qualified teachers and staff can pack heat — and some do. Interestingly, in the dozen+ years this policy has been in effect, there have been zero shootings of any kind in a Utah public school. But this WAS a close call. One thought: If the kid DID pull out the gun and shoot someone, I suspect an armed school employee would have put an abrupt stop to it long before the cops arrived. And the kid didn’t know who was armed, and who was not. As a former police officer, I personally know how hard it is to make those fine line decisions. If a gun had been found on another student, we wouldn’t be having this discussion. If these teens weren’t searched and another shooting had taken place, you’d be the first to condemn. You’re a coward because you hide behind “guest”. Man up or shut up. We would have this discussion, because a search can be done in a much more respectful manner; this only requires some minimal respect for people’s rights and dignity. A concept evidently totally alien to you and your ilk. And ah, yes, I will keep hiding behind “guest”. Do you know why Jefferson and Madison wrote the Kentucky and Virginia resolutions anonymously? Because some things needed to be said, and the authors needed to make a retaliation by those wielding power a little harder. It’s a noble tradition (as much as yours is ignoble). As for “shutting up” – or what, LOL? For you to put yourself at the same level as Jefferson and Madison is a clear indication of your narcissism and delusion. At least I choose my inspirations wisely, rather than following Adolf, Josef or Kim. Yep. ‘Nuf said. Please move along. Your opinion is irrelevant here. “Former police officer”. Enough said. You’d defend anything these ‘officers’ did. Period.